Since 17 September this year, fertilizers are being distributed throughout the country. 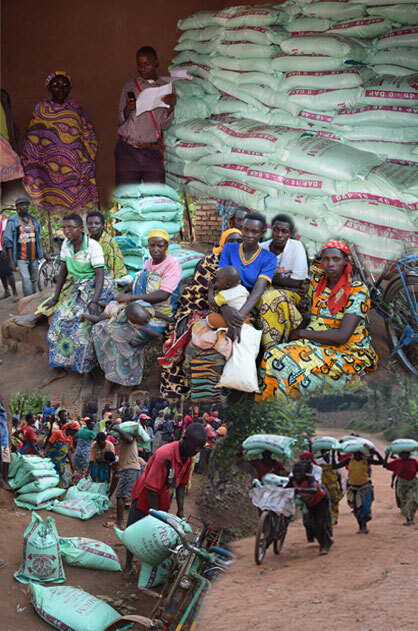 The G50 members receive fertilizer in their villages thanks to a better organization introduced by AUXFIN Burundi. With its G50 approach, AUXFIN Burundi is revolutionizing the rural world. The G50 approach is a grouping of 50 local households in the village. It is therefore easier to organize services for the rural population. AUXFIN has used this approach to introduce a system of organization and community activation for more than two years; this system is called "UMVA". Through this UMVA system, small farmers can access subsidized chemical fertilizers more easily. Concretely, AUXFIN Burundi has set up this platform (UMVA) that allows small farmers grouped in the G50 to order and pay for fertilizer electronically via tablets. Farmers recover fertilizers more easily because the organization ensures that fertilizers are distributed to the village where the farmers are. Thus, farmers in the G50s no longer waste time to pay advances and balances by traveling miles to the nearest microfinance. Also, the fertilizer easily reaches them because the group recover the fertilizer for their village.